The CE-608 regulator is designed for use on 2009-2013 FLH-FLT with the stock oil cooler. 1) Remove the oil cooler cover. 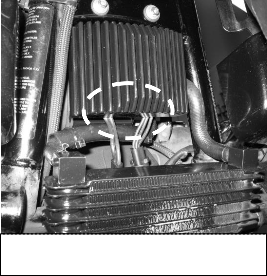 Remove the two Button head TORX screws located below the oil cooler. 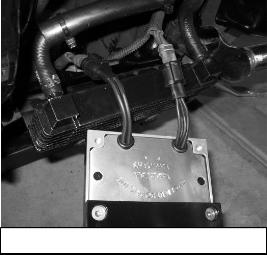 This will allow the oil cooler to shift out of the way allowing access to the regulator mounting bolts. Leave the oil lines connected. 2) Remove the two-Â¼ 20 nuts that hold the old regulator on. 3) Lift the old regulator off the mounting studs and tilt it forward to access the wire connections. 4) Remove the locking clips and disconnect the stator and battery plugs. 1) Reattach the oil cooler with the two button head torx bolts removed in step 1 above. Leave the cover off. 608 regulator. The tube will also prevent chafing during any contact with the wires. 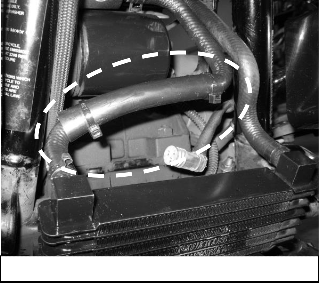 4) Connect the stator and battery plugs with wires routed in front of the oil line covered with plastic tube. (Photo 2, right) The wires should not contact the raw rubber hose, but may rest on the plastic tube. 5) The new regulator will attach to the back side of the cross bracket located about half way down the front frame tubes. Position the regulator so the ¼ -20 mounting holes line up behind the holes in the cross bracket. Using the ¼-20x ¾ allen head cap screws supplied, install a flat washer then a rubber washer on each bolt. Install one bolt in each hole and tighten. (Photo 2, right) The wires should not contact the bare rubber hose, but may rest on the plastic tube. 6) Reinstall oil cooler cover. 7) Start the motor and check battery voltage. Battery voltage should run 14 to 14.6 volts. Photo 3- CE-608 installed on frame cross member. Wires contact installed tube only. For complete product listing and technical information see our web site.